CYBER SECURITY - ARE YOU DOING IT RIGHT? 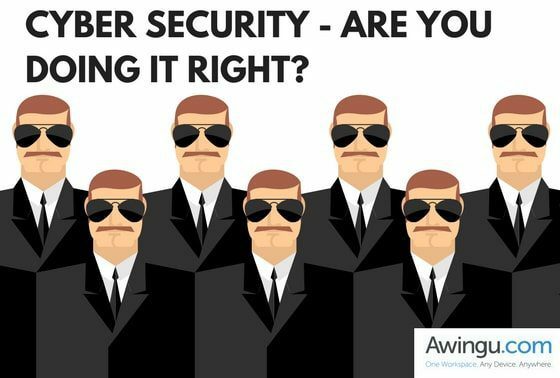 CYBER SECURITY – ARE YOU DOING IT RIGHT? The following text is a contribution of a freelance writer, Jenny Holt. Cyber security is an important concern for businesses, and for a good reason. Cyber-attacks are expensive to remediate, disruptive to your business, unsettling for employees, and can have long-lasting effects on your business’s reputation. The prevalence of cyber-attacks is astonishing. Specialty insurer Hiscox recently released the Hiscox Cyber Readiness Report 2017, a survey of 3,000 businesses, which noted that over half of the companies surveyed had experienced a cyber-attack in the previous twelve months. Among US companies with over 250 employees, the number was much higher, at 74%. About a quarter of companies reported two or more attacks in the past 12 months. Educating employees about cyber security is critical to keeping data safe. Many security breaches result from employees inadvertently disclosing sensitive information to hackers, thinking that they are communicating with someone inside the company. Hackers send an email that appears to come from within the company, requesting sensitive information through unofficial channels. Thinking they are helping out in an urgent situation, the employee complies, and the data is compromised. The Ponemon Institute estimates that 80 percent of business data leaks are the result of human error. Another common cause of breaches is simple passwords. Employees must use complex passwords, and they must be required to change them frequently. This will make it much more difficult for hackers to get into their accounts and wreak havoc with your organization’s data. Every employee in your organization should have cyber security training. They need to understand the dangers of malware, phishing scams and other ways that hackers will try to infiltrate your network and hijack your data. Test employees regularly to make sure that they are practicing what they have learned. Allowing employees to work remotely can be a win-win for the company and the employee. The employee gets to work wherever they want, and the company can hire the best person for the job – at the best price – regardless of where they live or their willingness to relocate. But there is a downside to having remote employees. There is a higher risk to data security when you have people logging into your systems and data from remote locations and on mobile devices. Having remote employees presents a challenge for those in your organization who are charged with maintaining cyber security. Employees who work remotely will need to be extra vigilant about security, and they must take responsibility for their mobile devices. Whole disk encryption software will prevent unauthorized use of mobile devices and remote-wipe apps allow devices to be scrubbed clean if they are lost or stolen. There are many different software and application options you can invest in to support your remote workers. These include sophisticated in-browser solutions which run without any local data required on the device at all, ensuring data is kept secure even should the worst happen and the device be stolen or lost. Having your applications hosted in the cloud can make it easier to lock them down if there’s a suspected breach. Cloud providers typically have high-level security in place but verify the security of your provider before you sign up. Cyber security should be a company-wide endeavor, with everyone at every level taking some responsibility for keeping your company’s data secure. Your employees may be your most effective weapon in the war on cyber crime. Jenny Holt is a freelance writer and mother of two. She loves nothing more than getting away from it and taking her pet Labrador Bruce for long walks, something she can do a lot more now she’s left the corporate world behind.